In a previous post, I wrote about Forseti from a dedicant’s point of view. Today, I would like to start off the year with an exploration of some of His less visible aspects and faces. No discussion of this nature can ever be complete, and these thoughts will often be rooted in personal experience (UPG). This particular side of Forseti neatly intersects with the domains He is most commonly known for, those of law and justice. Our surviving sources tell us that in His hall, Glitnir, He puts all charges to sleep. Grimnismal 15, Glyfaginning 32. The word used in the Old Norse, sakir, implicates a legal suit and has cognates across several Germanic languages, including Old English (synn and sacu - "crime and lawsuit") and Old Frisian (seka ni sinne - "neither lawsuits nor crimes"). See, e.g, Rolf H. Bremmer Jr., An Introduction to Old Frisian, 127 (2009). Thus, in modern times we hail Forseti for assistance in legal matters and look to Him as a frith-bringer and a mediator. 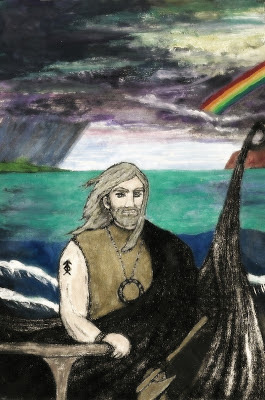 Delving into the realm of UPG: His connections to law might well reflect upon the higher reality of what He does for the Gods: if orlog (wyrd) can be construed as Their law, then He is the one They trust to speak that law. He is the God of the right decision. This aspect of Him very much ties into the Raidho/Rad rune, which modern worshippers, at least, have fittingly associated with Him. See, e.g., The Troth, Our Troth, Second Edition: Volume 1, 303 (2006). Successful journeys require good decisions, including good preparation. Moreover, good timing is also essential. The right decision is a choice that is made at the right time. The same choice made at an inopportune time can be the wrong decision! I'll note here that I see Forseti's axe as single-bladed for historic reasons and because He is very much a God of making the one correct choice. This section was inspired by an insightful question someone asked about Forseti--that is, whether or not He would be a good God to consult for matters pertaining to water conservation. I think the answer would be a resounding "yes." Looking to the surviving Frisian legend, Forseti is very much a God of various kinds of water. In the story, He first appears to His people on a ship at sea and brings them safely to shore. With the strike of His axe, He creates a holy spring and gives them their law beside those waters. As a site of worship, the spring was to be approached in reverent silence. Springs and wells have many longstanding spiritual associations. They are sources of sight and wisdom, places of execution, and places where holy vows may be spoken. Quite possibly, Forseti’s spring is tied to (or is on some level the same as) the Well of Urd. See, e.g., Richard Culver, The Stiller of Strife (2002). This likewise goes toward the idea of Him as a God of the highest law, the God of the truly rightful decision. Water is essential to life, but we often overlook it and focus on “flashier” drinks like ale and mead (I am indebted to the person who posed the original question for this wonderful observation). Water is also needed for physical cleansing. No wonder, then, that it is often associated with holiness. Ocean, streams, springs, wells, and lakes could all potentially have connections to Forseti. Interestingly, there is a pun that exists in various forms in several Germanic languages. “Lagu” (also the name of the Anglo-Saxon rune) can mean the sea, water or another liquid, or law. See Richard Cleasby, An Icelandic-English Dictionary, 405 (1874) under the LOGR entry. A similar correlation shows up in Modern West Frisian, with wet meaning "law" and wetter meaning "water." See, e.g, P. Sipma, Phonology and Grammar of Modern West Frisian, 173 (1913). Lately, I’ve been reading up on Thingvellir again and have been quite intrigued by the layout of the place: the Law Rock was allegedly close to the Öxará river ("axe river"), and executions and duels were held on nearby inlets and islets. Water and lawgiving have ancient connections. As an aside, it is worth noting that spring water can be a profound offering. I and others who have interacted with Forseti have noticed that He seems to enjoy simple, heartfelt gestures based on what is on hand. Forseti is very much a God of maintaining balance. Most often, we think of His role in an intra-community sense. In my opinion, He knows the ins and out of balance on many levels. As mentioned in the previous article, He can be an excellent God to consult for matters of psychological balance. This can include deep emotional work, a process that is not unlike navigating strange oceans. Forseti has a passion for order. With the sharp focus of a hawk, He can help a worshipper discard those things that are unnecessary or hurtful in their life, and hone in on the target that is truly important. How often do we truly listen to one another? We say “how are you?” as a greeting, a perfunctory salutation requiring a perfunctory response. Few people wish to hear a real answer to that question. Listening requires that we give the gift of time and that we put aside our own expectations. It takes energy and attention, and is not nearly as easy as it might seem on the surface. Forseti is a God who truly does listen. He can be very gentle, warm, and personable. In my interactions with Him, I have found that He likes to ask questions. Frequently, a form of teaching underlies His questions, but they are nonetheless sincere. Honest, open questions indicate real interest. They go toward meanings and break down walls. Forseti is also hailed as the Builder of Bridges. Many of the aspects discussed above go toward this face. A bridge connects two points separated from each other by difficult or impassable spaces: gorges, rivers, etc. Again, the idea of connection is important. Forseti does not flout boundaries the same way Loki does--far from it!--but He does show us how to build ways and passages through seemingly hopeless divides. He can be a good God to hail when a worshiper feels stuck. Forseti is known for being an eloquent God, though compared to some of our Deities, He can seem rather reserved. I've noticed that He enjoys delving into the deepest meaning of words, including the connotations behind them. Part of Forseti's wisdom is slowing down and choosing words with deliberation--sometimes easier said than done, especially when nervousness has its say. He seems to enjoy intelligent plays on words. I'll emphasize that I have never "heard" Him use humor to obscure a truth or to create distance. From spending time with Him, I've begun to understand how much we modern folk hide behind our "humor." Language and law are, of course, deeply connected. It is interesting how much our legal language can tie into poetic language. Alliteration was used as a device for remembering poetic materials, and it still shows up in legal language as well: e.g., "to have and to hold" on land deeds. Etymology can be very helpful when interacting with Forseti. More than once, I've been nudged to look up the history of a word and have gained new understandings that way. This may seem obvious, but one of the points of making a final decision is that it must become binding. All other options and outcomes are eliminated. In the U.S., we readily think of "freedom" as a synonym for "having many choices." But decision fatigue is real, and very damaging. Though we may be loathe to admit it, there is a peace to be found in the final resolution, to being bound to one path. A well drafted contract will not allow for a lot of deviation. The expectations are set, and there are consequences for a breach. Forseti can be an excellent God to pray to when a worshiper must stay a course. He can also be of great help when an agreement between a God and mortal hits rough waters. Oaths have deep significance in our faith, and they are one of Forseti's areas of expertise. He has profound insights into spiritual commitments and their implications. A true oath is given from the core, for the very best of reasons and with the most honorable of intentions. Forseti can sometimes be the God of the execution. He is truly fearsome in this aspect. You can either stand with Him or get out of His way. An execution means that a serious violation has occurred: a critical balance has been destroyed, and it must be rectified. This is the face He might show if something holy has been desecrated or a rightful bond has been broken. Finally, Forseti is a God of calm, silence, and stillness. His presence can be extremely grounding. At times, He is the quiet found in the very eye of the storm. Hail to You, Forseti, for all Your gifts!